It’s been a sad, confusing week. Last Friday, I was on my way to Dallas for my sister’s wedding and got word that one of Grayson’s teachers had very unexpectedly passed away at the age of 37. Alexis had been Grayson’s teacher since he started at The Caroline School in August of 2012. They spent 30 hours a week together. For a child who thrives on consistency and routine, Alexis was a hugely important part of Grayson’s life, and he adored her. All the children did. My heart is so heavy. The Caroline School is an incredible blessing to our family, and the staff there are all exceptional. And they are hurting. They have such a challenging job teaching amazing, but challenging, kids, and now they are processing their grief and the absence of Alexis at the school. This past summer, the school had to relocate due to their building being destroyed in the Memorial Day flooding. Alexis had an extermely difficult job, being in charge of all the kids in a place that was unfamiliar and not ideal for all their needs. But each and every day when I dropped off Grayson, she greeted us with a big smile and loved all over him. She never complained, even though I thought every day how difficult those months must have been for her. Also, the summer was when Grayson was recovering from his hip surgery and was even more high maintenance than usual. He was in a heavy, bulky wheelchair and had to be handled very carefully. Every afternoon, Alexis helped me out to our van, and spent a good 10 minutes helping me (very pregnant) get G into his carseat and the wheelchair lifted in the back. And she did this cheerfully and always told us to have a good day and she’d see us tomorrow. She’d chat with Charlotte, who also adored her. Last Wednesday afternoon, she helped me strap Grayson’s wheelchair into our new van, just like she’d done so many times before. And we said goodbye, unknowingly for the last time. This morning was Alexis’ funeral. It was obvious by the crowd that she was well loved and will be missed. The service was totally in Spanish, which I do not speak, so I do not know what was said, but I’m so glad our whole family (minus Charlotte) was there to honor her. Grayson did incredibly well- he sat contentedly in his wheelchair, with his headphones on, and in his way said goodbye to the teacher he loved so much. I do worry about him, how he will process her absence and not know why she is no longer with him at school. It’s times like these that I long to know how much he understands and I so wish he could verbally communicate with us. And I’m so thankful he still has Kristina, the other amazing teacher in his classroom. And I’m praying for her, because what a loss she is suffering. 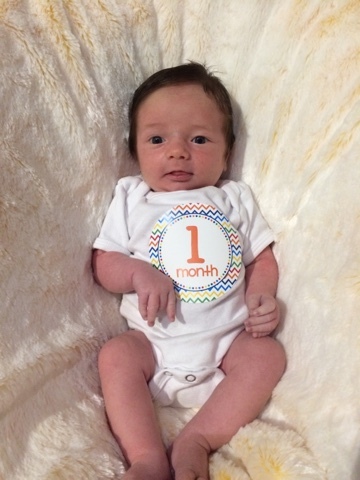 They were such an incredible, stable team and I always felt really good about leaving Grayson in their care. I’ve had the privilege of being taught by some incredible teachers in my life, and I hope that I impacted kids in a positive way when I taught school. But it is something else entirely to watch your own children be so blessed by a teacher. I know I thanked Alexis all the time for all she did for Grayson, but I hope she truly knew how special she was and what a gift she had with reaching special needs children. Kristina told me the other day that even though Alexis didn’t have children of her own, she considered the kids she worked with her babies. And I feel so honored that Grayson got to be one of Alexis’ babies for more than three years. We love you Alexis, and you will be missed. Rest in Peace, sweet lady. I am so completely stressed out right now. I won’t rehash all the details here, because I honestly don’t want to think about all the crap that’s happened the last six weeks or so, but it involves a LOT of money spent on unexpected house repairs, shady repair people, car repairs, and hours and hours in the car with three small children. It got to the point a few weeks ago where I was dreading getting out of bed in the morning because I just knew something bad was going to happen. Something has got to change. I hate, HATE driving and I spend hours in the car every day. And to make it worse, I think Nolan hates the car more than I do and screams almost the whole time we are in the car unless we are going 70 mph on the freeway. And this rarely happens because Houston traffic is awful, even at 2:30 in the afternoon. And when Nolan screams, it upsets Charlotte, and she screams. Then the two of them screaming stresses out Grayson and he starts to cry. And then I feel guilty and upset that all three of them are so miserable and my anxiety goes through the roof, and a lot of times I start to cry. We are a mess. Today we were in the car almost four hours total. That’s not right. We were trying to get to a doctors appointment for Grayson- an appointment I’ve already had to reschedule twice. There was an accident on the freeway and we were trapped for almost two hours- and had to cancel the appointment. The kids were screaming almost the entire time. Finally, we made it to Chick Fil A, and thank God for the sweet woman who helped me get everyone in (a stroller, wheelchair and toddler). Nolan was still hysterical and she offered to get him some ice cream to calm him down- and she was being totally serious. Ha! Ryan met us there (he took off work early to take G to his appointment, ugh) and we ate, Nolan nursed, and Charlotte played. We all calmed down, but then we had to load everyone back in the van to get home, and of course that got Nolan started again. I don’t want to be a stressed out mom, with stressed out kids, but I fear that’s the atmosphere we are in right now. People say, don’t wish these days away, enjoy your kids when they are little. That’s not the problem with me. I do enjoy my kids- I just don’t enjoy the rush, rush, rush in the morning just to sit for 45 minutes in traffic with crying babies. I don’t enjoy doing something fun and relaxing with them in the morning, only to be faced with the decision whether or not it’s worth it to drive all the way home for an hour, only to turn around and drive back in again. I hate listening to Charlotte cry “I want to go home” and “I want to stay at home with you” and I can’t give her what she wants. 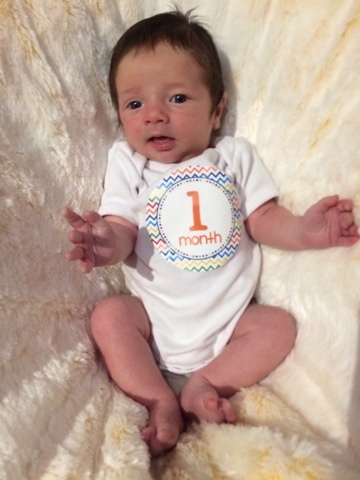 Today you are one month old! I’m going to try really, really hard to keep up with these pictures and letters for you just like I did for your brother and sister. 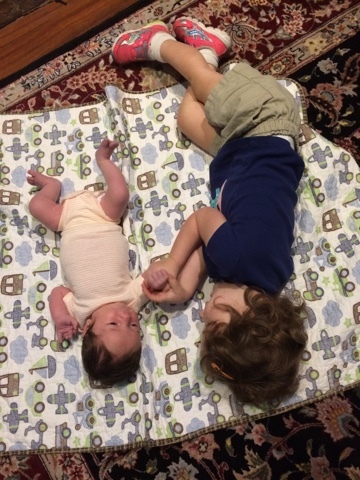 Please forgive me if I get behind though- life with three little ones is a little crazy! Even though I feel like much of the time I’m just trying to make it through the day, I really am trying to savor this newborn stage. I absolutely love newborns, and am especially enjoying it with you, my last newborn. You are so easy- as long as you are being held and fed, you are content. You still sleep much of the day, and love to nap on your tummy, all curled up. At night, you usually give me one 4.5-5 hour stretch when we go to bed, and then are awake to eat every 2-3 hours after that. I am so, so thankful that breastfeeding is still working really well- I hope we can continue making it work! You and your big sister Charlotte already have a special bond- she absolutely adores you (except when you are screaming in the car) and she loves to coo and baby talk you. When she gets close to you and starts talking, you start kicking your little legs and “smiling” with your eyes. We are working on her being gentle with you- teaching her she can’t lay on top of you or play catch with you just yet. 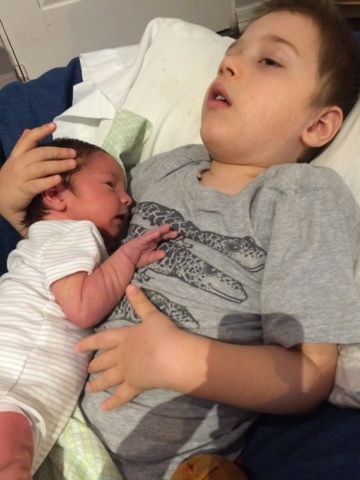 We’ve only put you and your big brother Grayson together a few times, but I know as you get bigger and mobile, he will be delighted to interact with you. Sweet boy, it always amazes me how quickly and deeply I can fall in love with a tiny little person. You fit perfectly into our crazy little family and we are all so thankful that you are here. I can’t wait to see what life has in store for you. 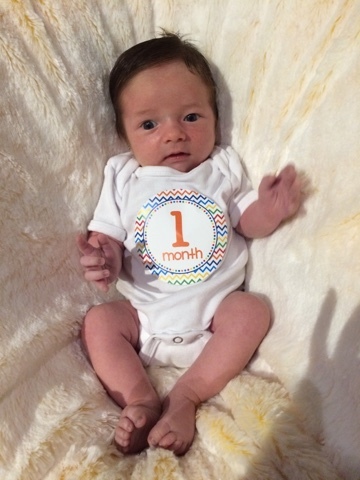 Happy 1 month, buddy.